New Yorkers are fussy about dirt. Too little is the suburbs. Too much is the country. Just the right amount, say, on a stroll along Broadway in the West 90s, is the real New York. Some old-time city residents even mourn the super-grimy, edgy, “I’m walkin’ here!” aura of last century Times Square. Translation: it was too damn clean. When I visited on opening weekend (March 15-17, 2019), I, too, was overwhelmed. Every surface, from the glass-and-steel supertall towers (one of which, 30 Hudson Yards, is now the fifth highest building in the U.S.) to the luxury retail mall’s walls and floors, gleamed. 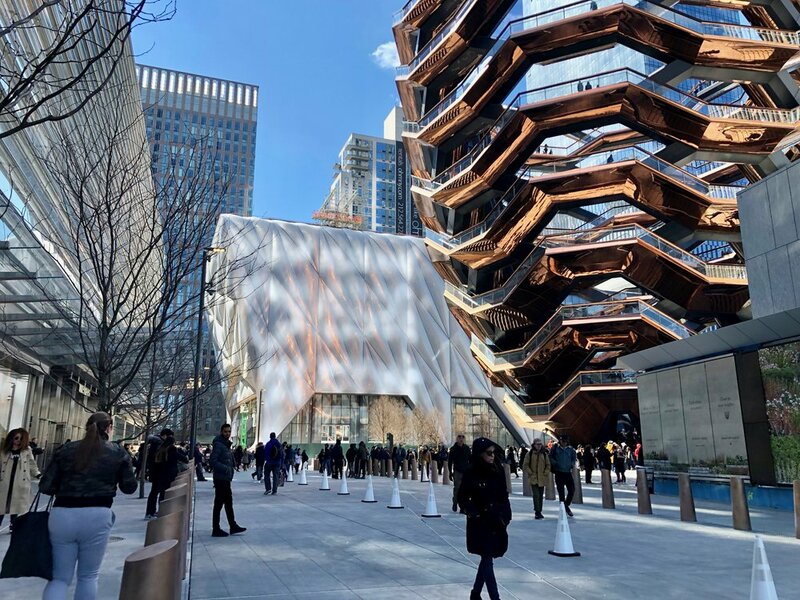 The plaza’s objet d’Instagram, “Vessel,” glowed like a penny in the sunlight and threw warm coppery reflections onto the white retractable shell of the adjacent arts complex, The Shed. The only dirt I could find was in the specially designed “smart soil” in the vast planters filled with gorgeous purple pansies. Even that dirt was clean. Did anyone notice? Thousands of visitors filled the 5-acre plaza, lined up to climb the 154 flights of stairs in the Vessel, flowed politely onto the seven floors of escalators at The Shops and Restaurants mall housing the city’s first Neiman Marcus, and ate snacks in the bakeries and food shops. The hordes were diverse, local, young, excited and curious. They were having fun. So was I. Then I realized what the critics missed. The futuristic new neighborhood does fill a niche, and not just for the .1 percent. It’s a vacation from grit! Available to all, and just a subway ride away. A neighborhood with free Wi-Fi, 28,000 plants, 200 mature trees, specialty snacks under $10 and public revolving art exhibits? 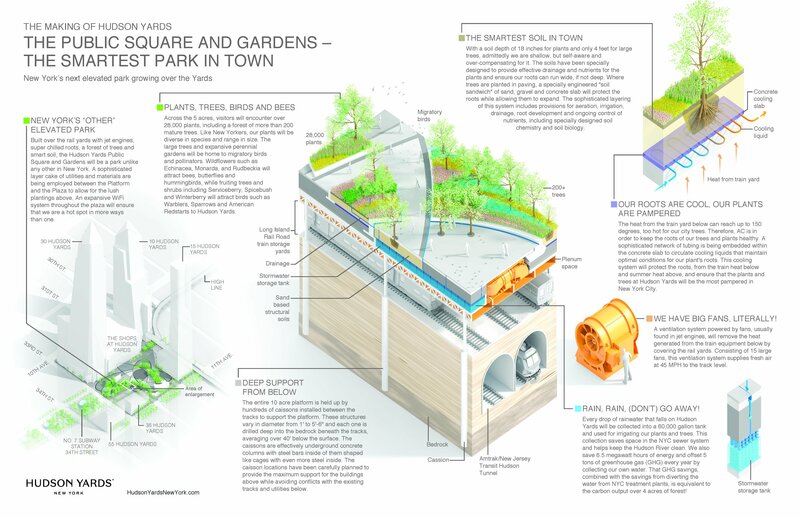 In close proximity to the High Line park? All sorts of people, from locals to tourists, will come for a clean getaway. By force of nature they will humanize it and, over time, it will acquire a unique patina all its own. If not from New Yorkers, then leave it to the birds.